← No more crappy kebabs! I am severely late to this party, but I’ll say it anyway: The Daily Catch in Boston is one of the best restaurants anywhere. For the last few years, my girlfriend and I have made it our last stop on the summer holiday to Cape Cod – taking the trip into the North End to have some really great Sicilian-American pasta, then catching the late flight back to the land of cheese and yogurt. (Making friends on a plane is easy when you smell like garlic…or not. Depends on the airline.) It’s a way of making the end of the favorite vacation of the year seem less ominous for a few enjoyable minutes. I first went to the Catch at the beginning of a Massachusetts vacation in 2008, on the recommendation of and with a friend of mine who is no slouch herself at hunting down deliciousness. I was slowly on my way to a college reunion in the northwestern corner of the state and had taken up residence at the esteemed Long Wharf Marriott* for a few nights beforehand. I hadn’t been to the North End more than a couple of times despite being in Boston quite a bit over the years, and even having lived there for a few months in 2003. I recall one house party of a college friend, and one dinner with the editor of the Boston Globe** – that was the sum total of the North End for me. So I enjoyed the walk up from Long Wharf and marveled at how much nicer it was to have the Big Dig finally dug. Boston just gets nicer by the year as the city figures out how to best use the Greenway but at that time we were just thrilled that the green wasn’t actually rotting steel girders on the X-Way. The Daily Catch’s original Hanover Street location, for those who haven’t been, is a hole in the wall. Charitably. The tables are set tightly together and/or pushed into corners. You can pre-inspect the wall-mounted chalkboard menu here to save some neck strain; from certain tables it’s a difficult read. The kitchen is, well, right over there – from pretty much any seat in the house – so you can watch Chef Basil cooking your selection of choice, as well as eavesdrop on the banter between the chef and his brother (the waiter) and the other employees. It’s a treat if you enjoy regionally-accented ball-busting. I assume the delivery of your food in the frying pan is a necessity of lack of storage space for plates and a desire to minimize (all-human) dishwashing, but it would make a fine contrived addition to most restaurants’ atmosphere as well. Pretension is definitely not on offer, nor advised to bring with. We were indeed offered a selection of fish, some of which had been caught by the chef himself – the fresh-caught striped bass was hardest to turn down. Taking leave of my usual Italian-American restaurant ordering method (always get the special!) since we typically only make it once a year, I had my usual Puttanesca (see photo above right), while my girlfriend branched out into the unknown by ordering the ground squid/Aglio-Olio pasta (both $21). 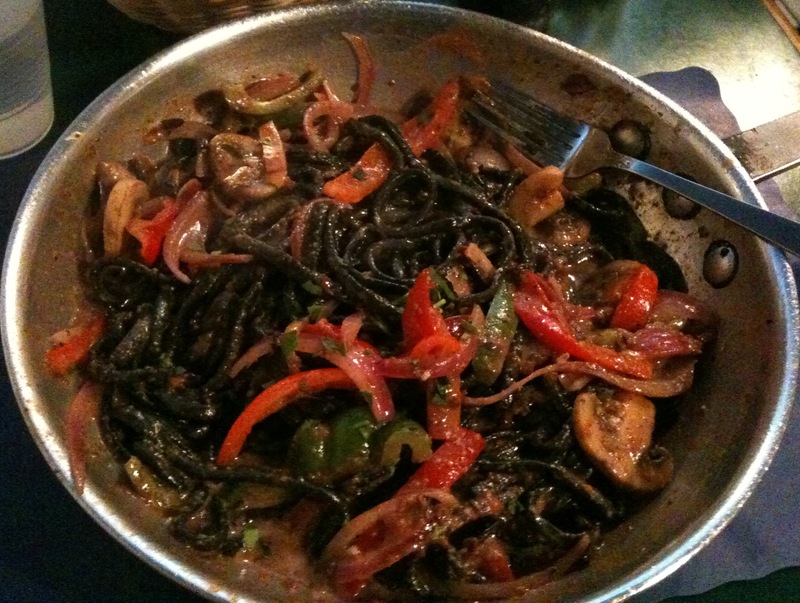 Both of these dishes utilize one of my favorite noodles: the squid-ink infused linguine ribbon offers a slightly brinier flavor, although it’s very subtle. Obviously with ground squid in the mix, it’s an all-parts-of-the-animal architectural victory – but how did the dish taste once built? Well, we both thought it was one of the best things we’d eaten in forever. The squid is ground up very finely, like small pellets of hamburger, to the point where it is difficult to distinguish whether you’re eating ground garlic or squid – this also because the garlic flavor is like WHOA. We didn’t think it was possible to renovate something so simple (Aglio-Olio is on every European Italian menu) into something so fresh and delicious, but we were more than pleasantly surprised. Aglio-Olio competed well with my longtime (since the original visit!) favorite Puttanesca, which I like so much I’ve started riffing on it at home. It ostensibly involves a kalamata olive and anchovy base, and the Daily Catch version also leans on very coarsely chopped peppers and onions and (naturally) a whole lot of garlic. It is a wonderful dish; you’ll be sopping up the sauce after you’ve wolfed down the noodles. At home, I’ve tended to go heavier on the fish, including sardines in the mix instead of the peppers and onions, but then I have a long way to go to achieve honorary status in the Freddura clan. Which reminds me of last year (2010), the first year I took my girlfriend with me. Mama Freddura came waltzing in with a stack of T-shirts, in what seemed to me to be an answer to a question that had been asked before I got there, but might also have been just an effort to clean out a closet. As she shouted out sizes and her son tossed the shirts around the room, I remained silent, not wanting to claim something that might be intended for someone else. As the pile dwindled, she called out XXL for the second time, with no answer. Even though it was a size too big, I raised my hand and got a T-shirt from Mama, and I’m happy to say it’s the same design that one of her kids is wearing in the family photo on the wall. Wearing it is, I think, as close to Sicilian-American as I’ll ever be. *I wasn’t paying; those were the days. Honey, you could be a Bob, a Henry or maybe even an Angelo. This is Mama Maria. Thank you for spelling our surname correctly and please tell me your true size so I may send you a good fitting ‘T’ for your body, As an architect at heart your have described the the essence of our restaurant’s true nature straight from the heart. Mangia forever. Maria Freddura and all seven sons… and Papa Paul, too.